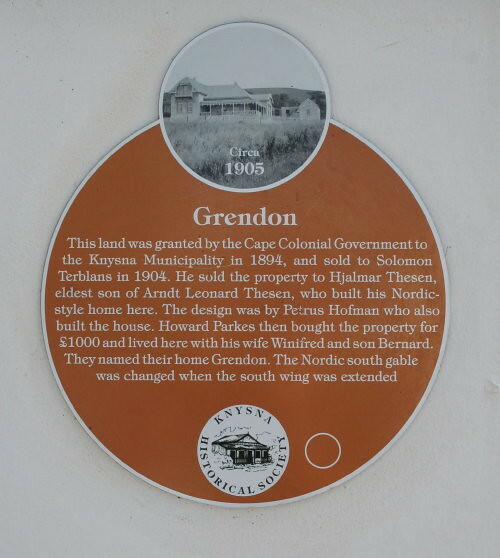 Circa 1905 Grendon This land was granted by the Cape Colonial Government to the Knysna Municipality in 1894, and sold to Solomon Terblans in 1904. He sold the property to Hjalmar Thesen, eldest son of Arndt Leonard Thesen, who built his Nordic-style home here. The design was by Paulus Hofman who also built the house. Howard Parkes then bought the property for £1000 and lived here with his wife Winifred and son Bernard. They named their home Grendon. The Nordic south gable was changed when the south wing was extended.